Inheritance tax (IHT) receipts taken by HM Revenue and Customs (HMRC) jumped to a record-high £4.6 billion in 2015-2016*, up 21% from £3.8 billion a year earlier says Wilsons, the leading private client law firm. 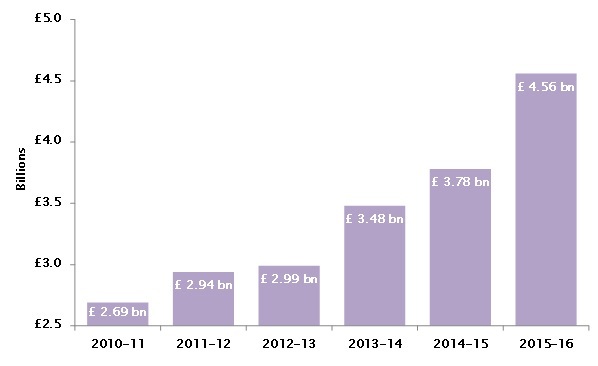 Wilsons adds that the £4.6 billion collected by HMRC in the last year is an increase of 70% from 2010-11 when the total amount raised was just £2.7 billion. Wilsons explains that a major driver of the increase in inheritance tax (IHT) revenue is that more estates are being caught in the ‘IHT net’ as property prices rise. The current threshold, after which estates are subject to IHT, has remained at £325,000 since 6 April 2009. Wilsons says that, despite the record IHT take, the Government has recently announced plans to introduce new dramatically-increased probate fees that would mean estates worth over £2 million would pay £20,000 for undergoing a probate instead of the current £215. Wilsons points out that the Government is introducing a new main residence nil-rate band for the primary residence when it is bequeathed to a direct descendant. This new band will add an extra £100,000 to the threshold in 2017, and by 2020 will add £175,000. This band will gradually bring the threshold to £1 million for married people, with certain conditions. However, these measures will do less for childless couples and individuals who have never owned their own property.